HAMDEN, Conn.-The Black Bears earned a weekend sweep of the Quinnipiac Bobcats on the back of a 3-0 shutout by Loryn Porter on Saturday. 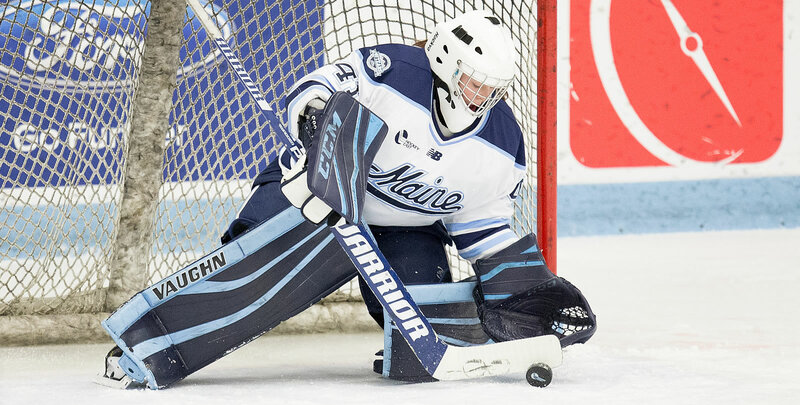 Porter, in her sixth start as a Black Bear, turned away 14 shots for the victory. The Black Bears' (2-0-0) defense never allowed Quinnipiac (0-4-0) more than six shots in any period during the two games in the series. Liga Miljone opened the scoring with her first collegiate goa in the early minutes of the second period. Miljone handled a short dish from Tereza Vanisova in the slot and sliding it between the goalie's pads. Vanisova jumped on the score sheet herself at 10:22 in the third. Shorthanded, she scooped a puck at center ice and cut through three defenders across the blue line and cut in on a breakaway. Vanisova scored her third of the year with a backhanded chip over the left pad. The penalty kill was strong on the defensive side as well, going 5-for-5 while down a skater. In total, Maine was 7-for-7 on the PK. An odd bounce extended the Black Bears lead with five minutes remaining in the game. Taylor Leech skated through to center and chipped a shallow puck from the blue line down the far side faceoff circle. Quinnipiac's netminder attempted to poke the puck away, but missed and had it skip in behind her. The Black Bears return home for another pair of out of conference matchups. Maine will host Sacred Heart on Friday Oct. 12 and Saturday Oct. 13 at 2 p.m.